Confort food at it's best, this Portuguese baked pork & beans recipe is very easy to prepare and makes a great meal. In a Dutch oven or large pot, heat the olive oil then add in the green pepper, onions, garlic, chouriço and bacon/pork. Saute over medium heat for approximately 5 minutes until the vegetables start to soften and the chouriço and bacon/pork starts to brown. Next, add the garlic and saute for another minute, then add the tomato sauce, water, pepper, paprika and salt, mix well then add the beans. Bring mixture to a boil on top of the stove then turn off the heat. 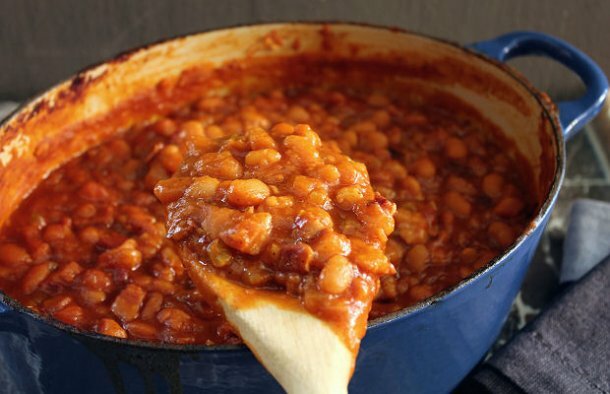 Transfer the beans to an oven-safe baking dish and bake for about 1 hour, stirring every 20 minutes. This delicious Portuguese style soup (sopa portuguesa) is high in protein and makes a great nutritious meal for the whole family. 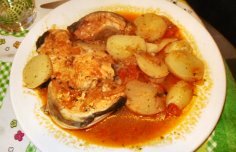 How to make Portuguese conger (congro) stew Azores style. 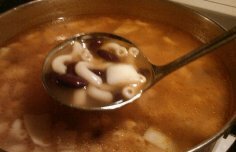 How to make Portuguese macaroni and bean soup.